Almost 20% of its 80,000 residents are expatriates, most from the U.S., the balance from Canada and Europe. They came to visit San Miguel de Allende. Then they stayed. They’re an engaged lot of talented people who paint, sculpt, make jewelry, offer art and culinary classes, run bakeries and beguiling boutique hotels, raise funds for restoration projects, teach Spanish, operate restaurants, volunteer and generally have helped turn this Mexican colonial city into a thriving, friendly, cultural community. One moment, the former advertising executive and his wife start building a retirement home in San Miguel. The next, he’s the curator of a remarkable non-profit mask museum showcasing over 500 indigenous Mexican masks (his passion has led to frequent speaking engagements at American universities). Visits to his small “Other Face of Mexico” museum are by appointment. Bill invites us to meet first over a glass of wine at his B&B, Casa de la Cuesta (which the retirement home morphed into). He tells us how he’s traveled all across rural Mexico, collecting ceremonial masks actually used in dances and rituals, then tours us around the museum across the lane. The variety of masks is bewildering. We see masks adorned with bull horns and boar bristles. And death masks with devil figures. One strange mask is in fact a thick wooden belt with a horse’s head the size of a football sticking out the front – it symbolizes the Spanish general on his horse, leading the Christian charge against the Moors during the Arab occupation of Spain. The whole exhibition is a fascinating introduction to the important role that masks play in Mexico’s many native cultures. Another day, we drive to the Sanctuary of Atotonilco, dubbed the “Sistine Chapel of Mexico,” for a look at its psychedelic frescoes. If all that art and architecture begin to overwhelm, you can find serenity outdoors at El Charco del Ingenio. 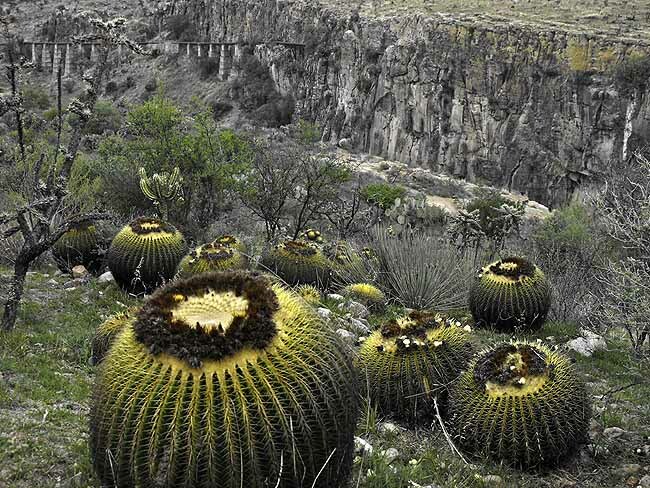 Created by private citizens’ initiative, this 67-hectare botanical garden and nature preserve on the town’s outskirts is home to a sprawling array of cacti from around the world. The man-size, Y-shaped cucharilla, over 300 years old, gets our vote as the most unusual cactus. Miles of hiking trails also wind through peaceful countryside overlooking a river carved into a valley floor, home to egrets and ducks. And refreshed after sipping a cactus juice, it’s only a scenic 15-minute walk back to town. And don’t get us started on the restaurants. We eat excellent organic scrambled eggs at Café Contento – the American owner teaches cooking classes in San Miguel, and his partner was the chef of former Mexican president Vicente Fox. In a lovely courtyard setting, The Restaurant is popular with expats (try the tuna tartare with wasabi, corn and avocado). And the candle-lit, cave-like La Grotta is our cozy refuge one rainy evening, with soul-satisfying, wood-oven pizza. George once even tries fried grasshoppers – a popular local snack – good as a salty, crunchy topping on guacamole. At sunset, rooftop bars are popular for drinking in the views (as well as the margaritas). 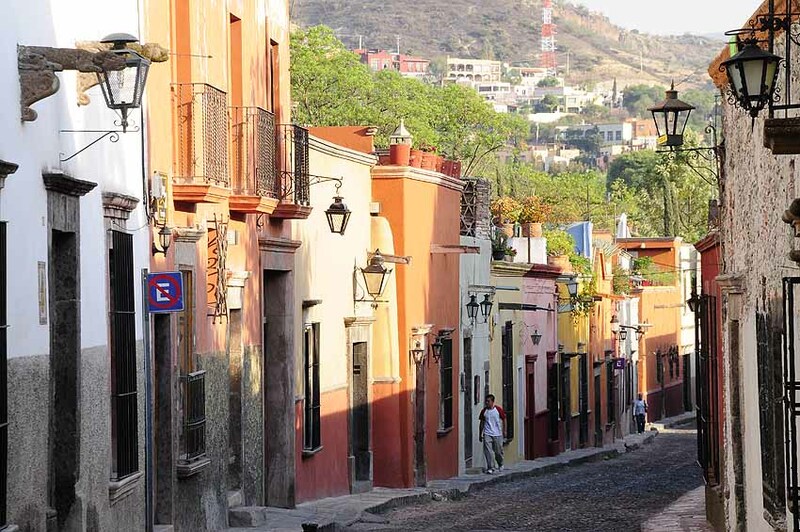 There’s more to do when you visit San Miguel de Allende. Discovering your inner child at a world-class toy museum. People-watching as you sit among the rose bushes of Jardin Allende square (fun to see residents puttering by on ATVs). Strutting your stuff at salsa dance classes. Simply soaking up the colonial charm while getting lost on San Miguel’s tangle of narrow atmospheric streets. Leon International Airport is a 90-minute drive from San Miguel de Allende. 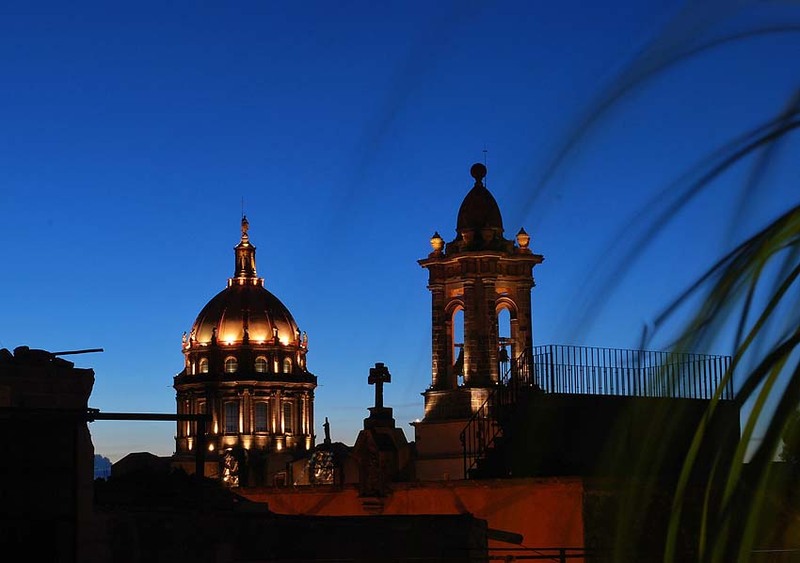 Or take the excellent first-class bus from Mexico City or Guadalajara (a four-hour drive). The first-class bus service in Mexico is almost like flying first class – really! Check ETN or Primera Plus. We took ETN to Guanajuato, stayed in Guanajuato for several days, then took another ETN bus to San Miguel de Allende. We stayed at the colonial-style Belmond Casa de Sierra Nevada. 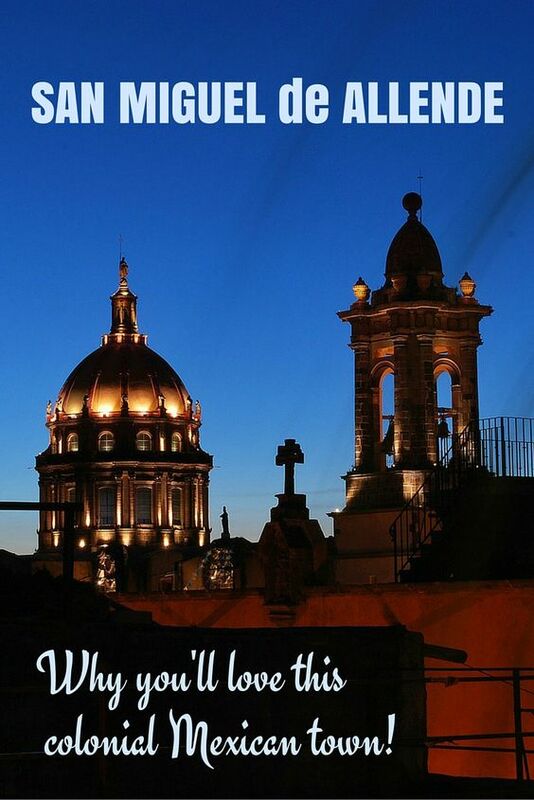 For more information on what to see and do when you visit San Miguel de Allende, see Visit Mexico’s official tourism site and Visit San Miguel (the official tourism site for San Miguel de Allende). 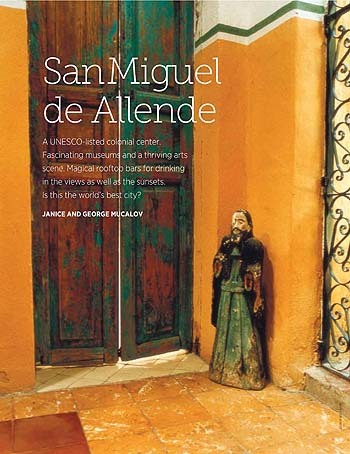 We chronicled the complete story of our visit to San Miguel de Allende in our travel articles published in both Compass magazine and Cruise & Travel Lifestyles magazine. We’re super excited! Our San Miguel de Allende feature in Cruise & Travel Lifestyles magazine won a Silver award in the best “Destination Travel (International)” category in the 2015 North American Travel Journalists Association annual awards competition. Click on the image below to read a PDF. What a characterful looking place and I love the masks! :-) Must add to my wish list! 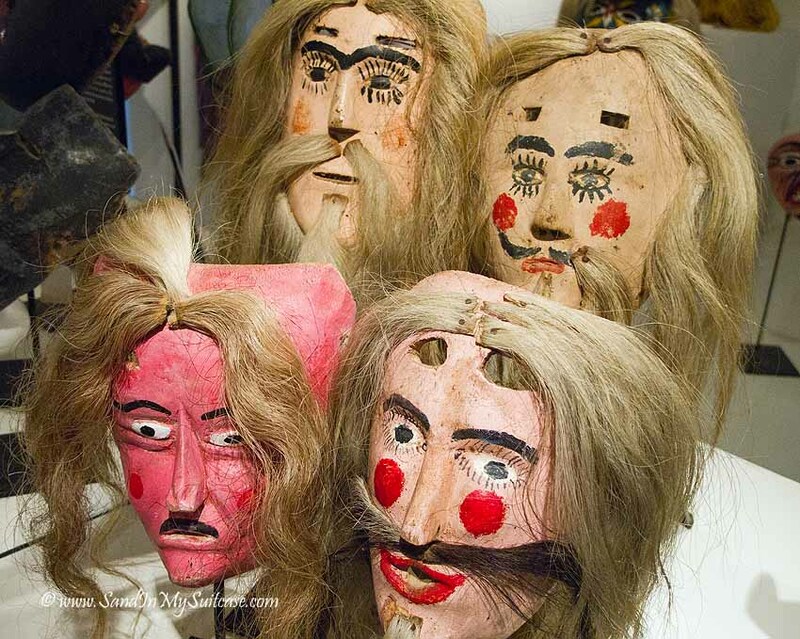 The mask museum is pretty cool – definitely a must-do when visiting San Miguel de Allende!